Is the UK really a democracy or is it a dictatorship in cloaks? Do you all remember when Tony Blair announced that Afghanistan was a direct threat to us UK citizens and that we would be sending in troops with America to fight the Taliban? That was in 2001. I was only 16 years old. Yet I saw straight through that lie. What a whopper! America was out for blood after September 11th and wanted one man in particular Osama Bin Laden. Majority of the UK population knew this. The marches in protest against sending in troops were the biggest ever in British history. Numbers quoted for those marches were around the 30,000 mark (police say 20,000, some sources say up to twice that number). I was one of those thousands of face. I might have been once of the few ‘children’ there but I can tell you, there were people from all works of life. Some poor, many middle class, few clearly wealthy. Some young adults, some elderly with walking aids, even the odd scooter here or there. There were Caucasians, Asians, middle Easteners and Africans like me. There were atheists, agnostics, muslims, christians, hindus, buddhists and more. Many came from all corners of the UK to join those of us who lived in London. We all marched for hours across London. We made it clear that we did not agree with the premise of the war and did not want our taxes paying for the illegal invasion of a foreign land. We signed petitions. The media talked about it for weeks on end. The outcome? 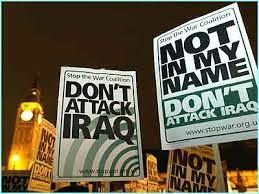 Tony Blair and his Government went ahead to approve the war and committed us to over 10 years of conflict. Our taxes paid for more than an estimated £37 billion. 454 of our armed forces died in that war. An estimated 21,000 innocent civilians living in Afghanistan, already terrorised by their Government and the Taliban, lost their lives. All because America lost 2996 people in the September 11 twin towers bombings. Sure that is a big number but what does it have to do with the UK really? Is the US not big enough to fight its own battles? Where is the proof that it was actually Bin Laden that carried out the bombings? Or maybe it was the Taliban. If there had been proof, the Afghanistan Government was willing to extradite those responsible. No such proof was forthcoming. Instead, the innocent were slaughtered. Now their blood is on our hands. Despite the fact we stood up and said no. So I ask you: how is this a democracy when a significant proportion of your electorate says we do not want it and you don’t even dignify them with a proper answer. No appropriate justification or apology for the cost of the war which we all could predict but not the government that is supposed to be looking after us. Can you imagine what we could have done with that £37 billion pounds instead? That is over £2.8 billion a year. That could have paid for 95,000 junior doctors, 113,000 band 5 nurses or 98, 000 high school teachers. We could have paid for most of the proposed high speed rail project (estimated £46 billion) or paid for an upgrade of our main railways and motorways. Which would you rather invest your money in? Personally, as a taxpayer I would have been happy for the money to be spent on any of the aforementioned worthy projects which would improve our lives. I resent that I involuntarily paid for the slaughter of thousands of innocent Afghanis. Similarly, we invaded Iraq and the costs are still adding up. Because our murdering politicians (Tony Blair and his parliament) decided like a bunch of dictators to pursue an agenda not in the interest if their population. Not only are we still paying the financial cost, we now face bigger threats from groups like Islamic State who have evolved directly from the Afghani/Iraq conflict and our role in it. So shame on you Tony Blair and whoever was in a position to stop this and chose not to. Shame on you, You murderers of innocent children and women and unarmed men. Shame on you politicians pretending to be democratic when clearly you are the worst kind of dictators. Who else wants to declare war on these criminals and invade them, capture them and extradite them to Afghanistan and Iraq so that they can be punished for their war crimes? Anyone?